This is a liquid filling line which was originally pre owned. 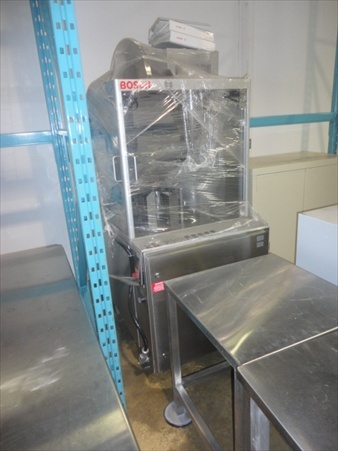 It includes an automatic positive displacement line of filling consisting of 4 heads manufactured from stainless steel and built in the year 2008. 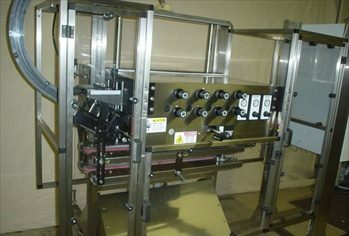 This used tablet capsule bottling line includes an unscrambler, electronic counter, induction sealer, stainless steel conveyors, a hostamp labeler, leaflet inserter, and more. The model is ACT 6000. There are three spindle wheel sets provided. Double cap stabilizer included with the SS cap chute which can be adjusted as required. Specially designed for flat and sport caps of 28 mm dia and capping at a speed of 130 bpm. VACT – 06 is the model that we offer for the 3 station kiss capper machine. Three sets of spindle wheels are provided which can be easily adjusted along with a pair of controls for the air clutch. This used Elf Liquid Filling Machine comes with 6 heads. Advanced Liquid Packaging provides a wide variety of used pharmaceutical equipment. This is a used Elf Gravity Filling Machine. It comes with 6 heads along with a conveyor having a length of 10 feet. It was used previously for the purpose of filling cleaners. The Cremer CF-1220 counter contains a detection unit with 12 channels. It exhibits a single-track conveyor which is used for transporting containers in to and out of the conveyor.